Up in the mountains, around 7 miles (11 km) from San Cristobal de las Casas is the small village of Zinacatan; translated it means “Valley of Bats”. The village is often included as part of a tour of local villages around San Cristobal and is best experienced with the help of a local guide, who can give insight and local knowledge that will help you to gain an appreciation of the distinct culture and customs here. The village dates back to Aztec times, when local salt mines were exploited and formed a major part of the economic activity. Today, the flower trade is the principal means by which the local people make a living. The people of Zinacatan have always been naturally talented trades people and merchants—perhaps a characteristic passed down from their Aztec ancestry. 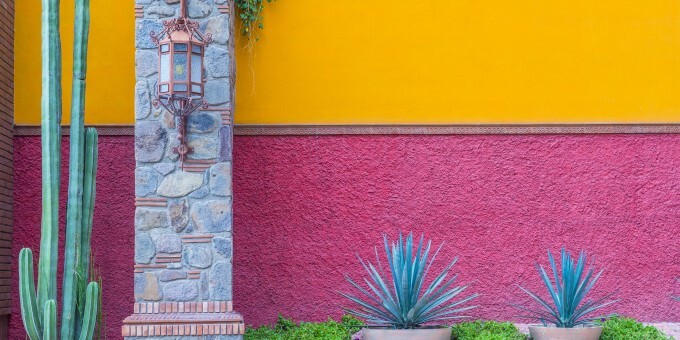 Like neighboring San Juan Cholula, (see Mini Guide from San Cristobal Page) the people in Zinacatan enjoy their privacy; like other peoples in this region, they can be identified by the clothes they wear: in this case distinctive purples and pinks predominate. All the clothes they wear are hand-made locally. The wool on the sheep, cleaning, dyes and knitting are all obtained “in-house”—nothing is purchased externally. Sheep are sacred here; they are treated, protected and mourned on passing as any other member of the family. If you are driving through this region take extreme precautions with sheep that may wander into the road. The most important local event here is held around the 10th of August: the festival to honour the Virgen de la Candelaria. Expect parties, processions and special markets during this time. Also See the Zinacatan Picture Gallery for pictures in and around Zinacatan. 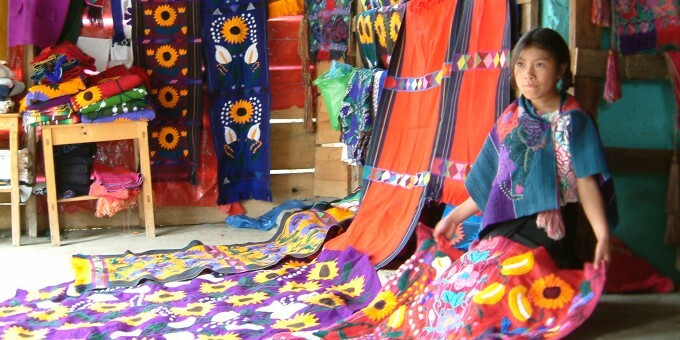 75% of Chiapas’ populous is made up of indigenous peoples. Chiapas’ indigenous people live within nine distinct communities, each with its own language, traditions, costume, belief systems & patron saint, spiritual leaders & healers and rituals that create a complete and distinct culture. The culture is patriarcal by western standards: women always follow behind the men; men chop the firewood, but women carry it; you will never see a woman wearing a hat. Each community has its own identity which is most visible by the colors and design of the clothes they wear: something that is strictly adhered to—you can always tell what community a person is from (whether they are a baby or an old man or woman) by the clothes they wear. People from different communities do not marry; neither must they detach themselves from the religious protocols set out by the community: to do so causes expulsion from it, leaving the couple (and their offspring) to fend for themselves outside of the protection and structure of the communities they were born into. As you drive or wander through this region, expect to see a world far removed from anything you expect in a developed country. You’ll see men and women working the fields using rudimentary tools and elbow grease. The living here is simple: women wake up early to cook and tend to family needs: men go out to chop firewood, ready for their wives to collect it and later will work the fields. The lifestyles, culture and rituals you’ll see here may not make much sense if you try to align them with an industrialized culture: it’s a key reason why having a good, knowledgeable local guide—who will be able to share important insights and local knowledge with you—is essential to get the most out of a visit to this region and especially the small rural villages. Like San Juan Chamula, Zinacatan offers awesome insights into a culture completely distinct to what you experience if you live in an industrialized nation. The main attractions in the center of the village are two churches, both worth a look, and some local market stalls selling crafts. There is an opportunity to buy some flowers and local crafts and take part in an Open House Experience – see below. Local Tours: Mexperience offers access to local tours and activities in and around Mexico’s colonial cities. Tours and activities are organized and run by well-established, professional and fully-insured operators. You can search for tours by location or category and make reservations online or by telephone. Buying tours in advance is more convenient and secure, and your spaces on the tour are guaranteed. Open House – Unique to Zinacatan, local tour operators in arrangements made with local people, bus visitors to Zinacatan to witness the humble homes of the villagers, eat some traditional food prepared in front of them at the house on an open fire grill or hotplate and buy locally produced crafts and textiles on display at the houses. See the Zinacatan Picture Gallery for pictures of an Open House experience. The high altitude and mountainous terrain make the climate in this area highly variable. It can get quite warm in the summer and cold in the winter. Rains can come at any time, but you will also need to pack sunscreen and a hat to guard against the sun. When you pack for Chiapas, pack clothes for all weathers; in the winter months you will need to ensure you pack a stock of warm and waterproof clothes.